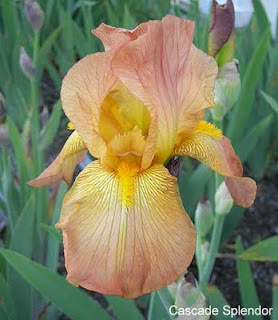 Miss Mary Williamson was the daughter of famed iris hybridizer E.B. Williamson, so it is no surprise that she grew up to become a renowned hybridizer in her own right. Perhaps her greatest legacy is her 1936 introduction 'Wabash', a tall bearded variety that was the child of 'Dorothy Dietz' crossed with 'Cantabile'. 'Dorothy Dietz' had been a favorite of the amoena pattern for many years, and 'Wabash' was a very nice improvement. It was an an instant hit in the iris world and with gardeners everywhere, and remained on the top favorite's list for decades. Above: Mr. W.J. 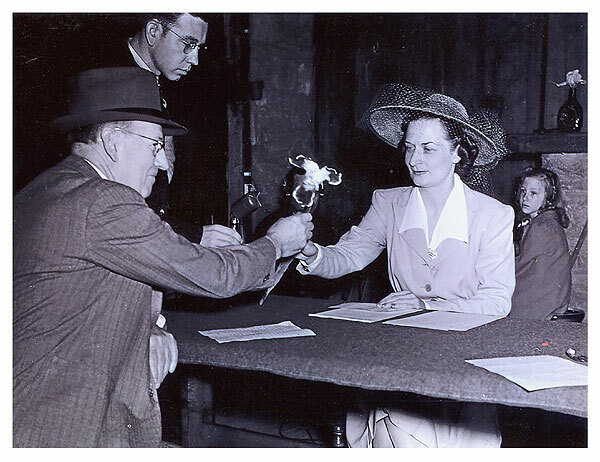 McKee, President of AIS, presents the Dykes Memorial Medal to Miss Mary Williamson for her creation Wabash, which won top honors in 1940. All the good qualities that won it so many awards are still present and 'Wabash' remains an oft sought favorite and keepsake of those who collect the old ones. If you seek it out be sure yours is correct, as the later introduction 'Bright Hour' was sometimes distributed under the name 'Wabash'. The true 'Wabash ' has purple based foliage - 'Bright Hour' does not. 'Wabash' is a true classic and a fit legacy for the life of a great hybridizer and irisarian. It's summer and the iris are hot, hot, hot. These are not reblooming iris, these are Asian Iris species that normally flower in the heat of summer. 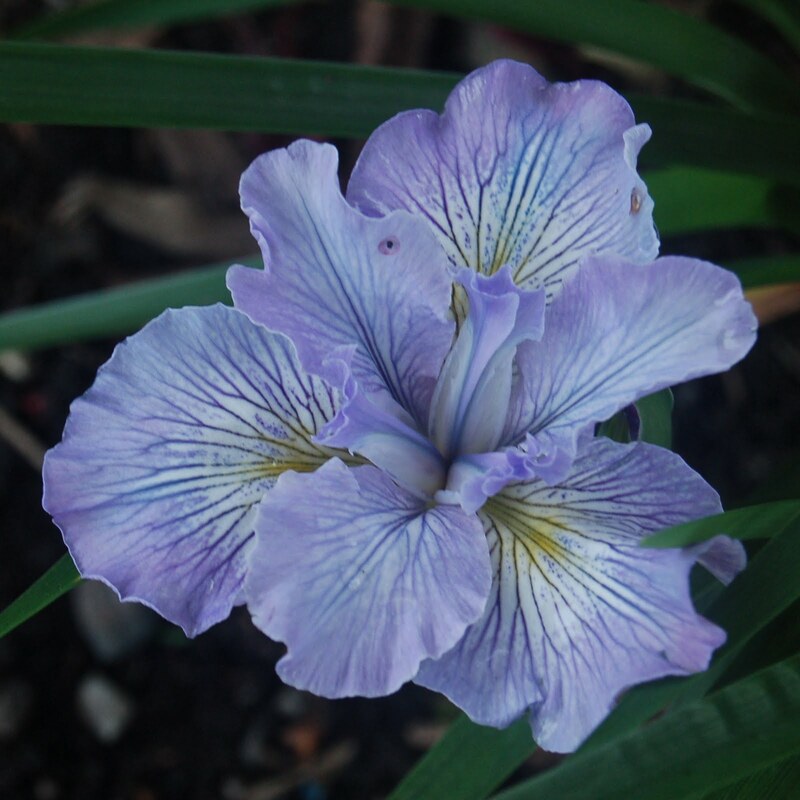 Two species have been kicked in and out of the genus Iris but they are both back in the genus Iris today. Although well known and widely grown, they have suffered from ridiculous common names like 'Blackberry Lily' (Yes, it is an Iris and NOT a Lily) to the descriptive but slightly cryptic name of 'Vesper Iris'. These tough iris are at their peak bloom during the hottest weather. Well known by the old name Belamcanda chinensis, the Blackcberry Lily is now properly Iris domestica. The slightly odd Vesper Iris, Pardanthopsis dichotoma, is now the much simpler Iris dichotoma. These easy to grow plants look very strange if you have only grown bearded iris. Each has tall leafy stems emerging from a fan of fairly typical iris leaves. Stems bear multiple branches and dozens to hundreds of flowers. Each flower is short lasting, but with anywhere from a few to a dozen open each day, the plants still manage a long blooming season. 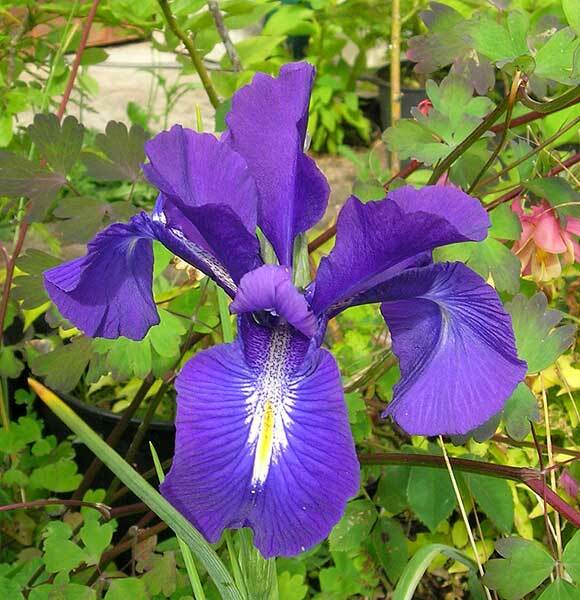 They are about the easiest iris to grow from seed. Started in spring you can have good sized flowering plants by the summer of the following year. Full sun and good drainage are ideal. They are both very drought tolerant and fully hardy in most of the US. Iris domestica opens its typical red-orange flowers in the morning and closes them by late afternoon. This is most appreciated by a gardener that is home during the day.The bright yellow variety 'Hello Yellow' only grows to half the height of the typical form. 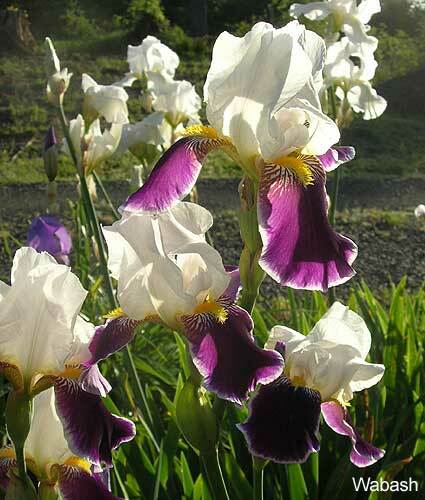 Iris dichotoma occurs in shades of lavender to white. Flowers opens near 4 PM almost like clockwork ( and the period known as Vespers), but closes by early evening. It is a very cheerful welcome home after a long days work. The hybrids between these species, called Iris xnorrissii, were originally introduced as the famous 'Candy Lilies' and occur in many shades. Newer hybrids have hundreds of flowers in a wide range of colors and with larger flowers. The two original related species retain ease of growth and a welcome explosion of bloom in the heat of summer. The spell of really hot weather this week brought the Siberian bloom season to an end here. “What?” I can hear you say, “it ended for me weeks ago”. So it did for me -- except for the few irises that repeat bloomed. This ability of some Siberians to give a second round of flowers a few weeks after the first remains a mystery to me. It happens every year, some years better than others, but after many years of observing it, I have seen no obvious relationship to the weather during or prior to the bloom season. This year it was quite minimal even though growing conditions were ge nerally favorable. Some have suggested that repeat bloom is due to late frosts that kill back some bloom stalks and result in the forcing of dormant ones, but there is no good evidence for this. Being well grown, mature clumps seems to be a necessary condition and there is certainly a genetic component to it. Most Siberians never repeat bloom, some do it occasionally, and a select few do it regularly. However, even they are not entirely reliable. You can have two well grown clumps of the same iris growing side by side – one will have several new bloom stalks and the other nothing. Further it may be that there are regional variations. Some reported repeat bloomers from the East Coast rarely do so for us in the Midwest, though there is no reason to doubt they do it on their home territory. This leaves the hybridizer in a quandary. Obviously repeat bloom, if fairly reliable, is a positive trait, but it cannot be guaranteed every year in every location. So, should you make a feature of it in the description for sale? Should the name imply repeat bloom? Some hybridizers (myself included) could not resist. Examples are Bee Warburton’s “Reprise” and Marjorie Brummitt’s “Violet Repeat”. Currier McEwen designated at least a dozen of his Siberians as repeat bloomers at registration and named some acco rdingly e.g. “Welcome Return” and its children “Again”, “Blue Encore”, “White Encore”, “Ever Again” and “Exuberant Encore”. 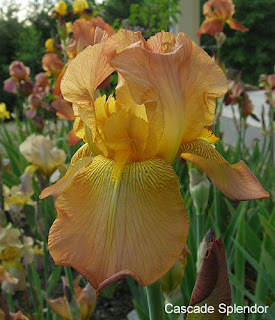 Elizabeth Scheffy’s “My Love”, an iris well known to repeat bloom, was a parent in the background of many of these. We have recently named “See Ya Later” and its offspring “Encore Performance” for their reasonably reliable capability under our conditions (note the genetic link again). 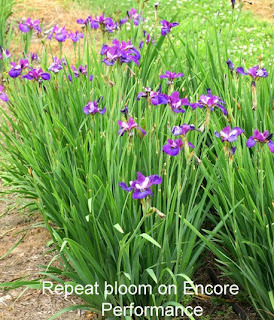 Several others, not so named, also regularly repeat bloom for us and others, particularly “Coronation Anthem”, “Somebody Loves Me”, and some of its children such as our latest repeat bloomer, “Judy, Judy, Judy”. Several of the Shafer-Sacks introductions do this for us too, particularly “Dance & Sing”, “Dawn Waltz”, and “Sea of Dreams”. Often repeat bloom consists solely of a few stems which, while interesting, does not provide a significant garden display. Can we breed to improve this trait? It seem reasonable to hope so because of the clear genetic fa ctor(s) involved, but there seems to have been very little advance in its reliability and extent over the years since the topic was reviewed in the spring issue of The Siberian Iris in 1994. I have recently been making some crosses between our most reliable repeat bloomers with the primary goal of examining whether a focused breeding effort can improve its quality and reliability, so maybe we will see over next few years. If you have any observations to add on repeat bloom, theories of why it happens, or information on what repeat blooms regularly for you, it would be great to hear -- and is anyone else breeding for this characteristic? In 1944 Cooley's Gardens introduced a new creation from Dr. Kleinsorge called 'Cascade Splendor'. 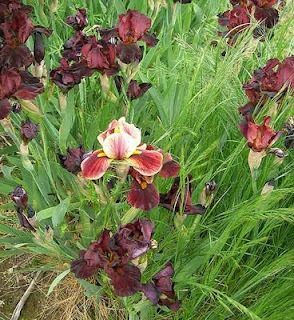 It proved to be one of the most popular irises of its day, and was heavily used by others in breeding better blends of all types. "Very large ruffled pink, tan and apricot blend, with extra heavy stalk 40 inches tall and bearing up to ten flowers. 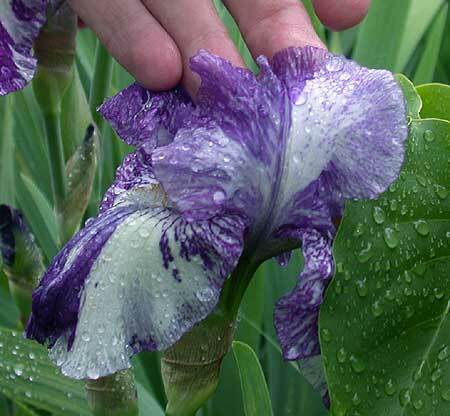 The ruffling is more pronounced than in any Iris we have ever introduced and is most unusual in so large an Iris. It blooms quite late." A child of 'Mexico' crossed with 'Goldbeater', it won an Honorable Mention in 1945, and the Award of Merit in 1947. More than a few people were surprised it never won the Dykes Medal. The amazing rainbow of color tones it displays changes dramatically with the play of sunlight over the course of the day. 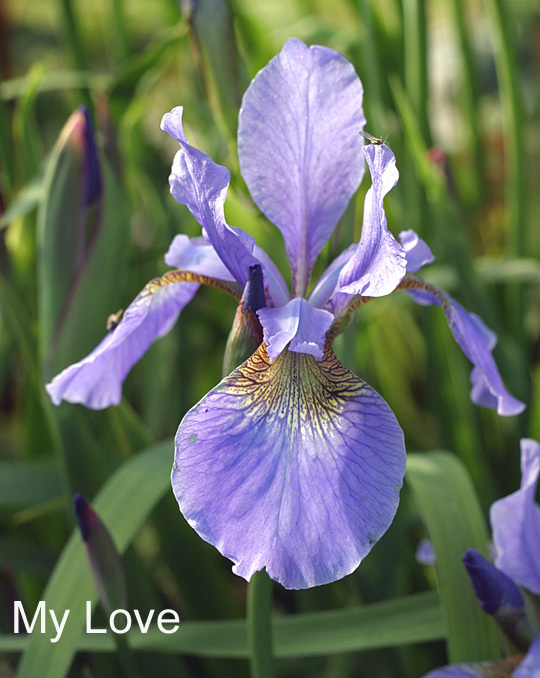 'Cascade Splendor' is a classic in every sense, and is still an iris well worth growing. All the good qualities it had in the 40's are still there. Give it a try. Visitors to our gardens and to iris shows often are surprised to learn that new varieties of irises are raised from seeds. “Oh,” they exclaim, “how do you do that? I recently had the gratifying experience of showing a young boy how to hybridize. He had come to the garden with his mother while I was making crosses, was thoroughly interested, grasped everything instantly, and was eager to try. I suggested that he pick out a couple of flowers that he’d like to cross. We made several crosses of the same flowers, just to be sure. Two of the crosses produced pods, and he and his mother returned to harvest the seeds. Since they didn’t yet have a bed prepared for planting at their house, we agreed that I would plant the seeds in pots over the winter. This spring, a goodly number of the seeds germinated, and the lad was able to take home a couple of pots of sprouts to put in their new bed. Since his mother is a master gardener, she could take the process from there. So far, so good. Now he knows the mechanics of hybridizing, and his mother will ensure that the sprouts get the proper care. But whether he will ever produce “good” irises is still a matter of some luck and yet more learning. The following are some random observations intended to be helpful to readers who may be at that same stage and would like to get beyond it. If one is interested in hybridizing, the opportunity to learn directly from a hybridizer in the person’s own garden is a great advantage. 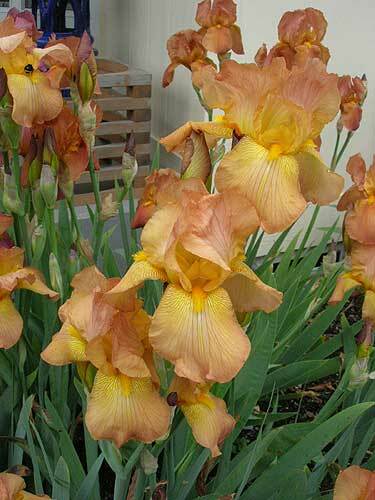 I was lucky to be able to learn from Earl Roberts, of median irises renown, in Indianapolis in the early 1970s. Earl was generous with his knowledge as well as with his “extra” rhizomes. From him I learned the basics of planting and care of cultivars, making crosses, harvesting and germination of seeds and lining out of sprouts. As soon as possible, I joined the American Iris Society, where I could discuss with and ask questions of more knowledgeable irisarians and profit from the various presentations, shows and garden tours that membership in a local chapter provides. I also picked up all of the iris books I could find, studying the histories of different species and varieties and their traits, and focusing especially on the development of certain patterns that I found particularly attractive. 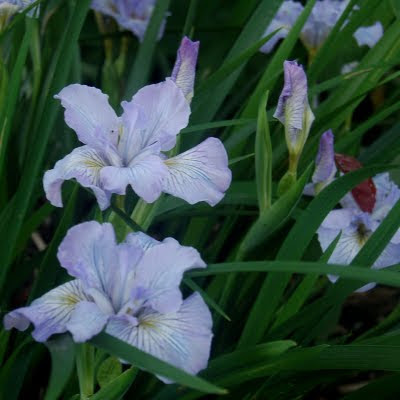 Meantime, I was making crosses among the irises that I had and adding to my original stock through purchase, trading and the sheer generosity of fellow irisarians, certain varieties that I wanted to use in breeding. If a hybridizer had unlimited acreage, money and time, he might be tempted, like one of Stephen Leacock’s Nonsense Novels heroes, to ride madly off in all directions. But, since most of us find ourselves constrained in one or more of these categories, it helps to develop goals that fit our circumstances. For many, if not most of us, our goals evolve as we begin hybridizing – they may be of color, pattern, branching, height, foliage, marketability, whatever, but focusing on desired outcomes gives some discipline to our activity and, arguably, increases the odds of producing something pleasing. And this brings us to the matter of what constitutes a “good” iris. The American Iris Society states that it "exists for the sole purpose of promoting the culture and improvement of the Iris." This embodies both the assumption that the iris can be improved and the assertion that it should be. What constitutes improvement immediately becomes material for dispute, because, unlike a utilitarian product such as a new machine, which either works better or doesn't, a flower, like art, is produced primarily for enjoyment and its appeal is subject to individual tastes. The application of standards, in such circumstances, is challenging, but inevitable. In that regard , one can hardly do better than to get a copy of the AIS’ Handbook for Judges and Show Officials, 2007 and frequently consult pages 54 through 64, which treat of garden judging of tall bearded irises. (There are similar sections for other types of irises.) These are the standards of AIS. An iris that meets these standards should be “good”. Whether any given new iris constitutes an “improvement” on already-existing varieties is material for another discussion. See other gardens. Hybridizers can learn much from attendance at regional conventions, which offer the opportunity to take part in judges training, and particularly, garden judges training. The iris is, after all, a garden plant, and growth habits not apparent on the show bench or in photos are important when making decisions as to what to acquire for one’s breeding program. Blessed is the hybridizer whose garden is visited by judges and other hybridizers. One of the most important aids to hybridizing is to have one’s flowers critiqued by others. Helpful suggestions will often be made, and a guest may be very taken by a seedling to which the hybridizer has paid scant attention. Serious faults found will save time and energy that might have been spent on a “dead end”. A caution, though. If the criticism isn’t that the plant is flawed, but that it doesn’t represent an improvement, then, just as with doctors, a second opinion may be advisable. 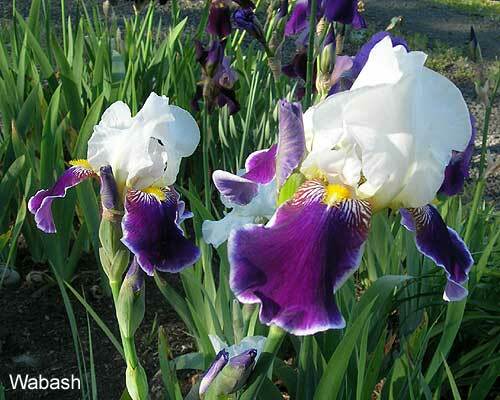 I also pay close attention to what garden visitors like, whether they are “knowledgeable” about irises or not. The budding hybridizer should not be shy. If a seedling seems promising, it should be taken to the show. Let the judges make the call. Finally, if I were asked to say what has been the most valuable single thing in my development as a hybridizer, I would say clerking – clerking at as many iris shows as possible. The opportunity to silently accompany and assist the judges as they examine and discuss the entries enables one to identify the strengths and weaknesses looked for in flowers, as well as to observe the preferences of the judges (including the biases and idiosyncracies of some). Frequent clerking also provides one with exposure to a very broad range of cultivars. And, last, it offers excellent opportunities for character building if one has entries in the show – gritting one’s teeth and keeping silence, for instance, as a judge disparages one’s prized seedling. Though admittedly brief and sketchy, I hope this has been helpful. What Is that Iris Doing?? Have you ever come across a bloom in your iris bed that had you looking closer and scratching your head? There are instances, both natural and artificially induced, of iris blooms exhibiting some strange attributes. Here's a few common occurrences that I've seen over the years. This first shot shows the effect of the herbicide Roundup on irises. The poison doesn't kill the iris plant, but it does distort the blooms for the following season. Colors tend to be washed out and petals not fully formed. This is a mild case seen here. 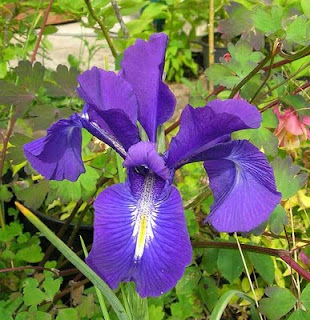 Some irises are unstable in their coloration. 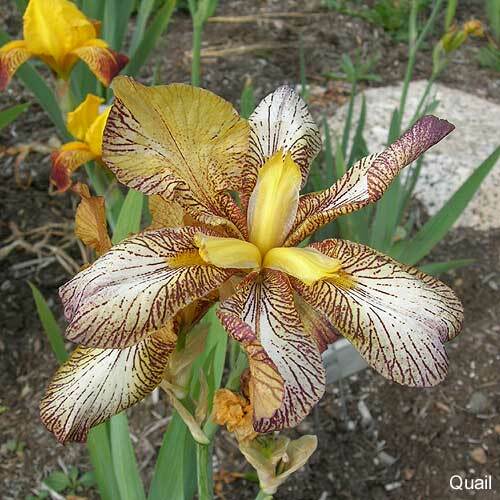 'Batik', one of the most popular broken-colored irises, is one such. Many irises will throw out swipes of a chimeric color on a petal once in a great while, but 'Batik' does so regularly as part of it's pattern. It has even been known to sport new rhizomes of stable plicata patterned flowers devoid of the color-breaking. 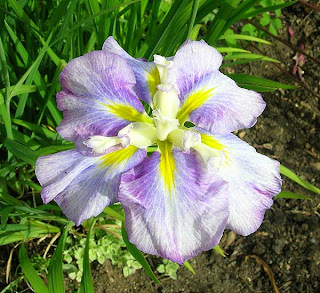 Just as some irises are unstable with their genes for color, some others seem to be unstable with their form. In my previous post about Flatties I mentioned the habit of 'Clematis' to be a typical iris flower - until warm weather sets in and new buds open in a flat form. Well, 'Quail' also shows a flat form but this time on only the last one or two blooms that open - as if it just ran out of some parts after making so many flowers and was left with just falls and extra pieces to work with. It is not uncommon to see multiple petals on an early bloom, and likewise late blooms sometimes lack all the parts they should have. This shot of a bloom on 'Goldfish' shows a range of petals and petaloids trying to mimic a normal flower, leaving a crazy quilt effect for the eye to try and decipher. Tho distorting the iris' lovely form, these different expressions in our favorite flower can add a sense of wonder and novelty on the rare occasions when they manifest. With the exception of the Roundup damage, they are naturally occurring phenomena and aren't a sign of a problem with your plants. Iona V. Campagnolo, Ex-Lieutenant Governor of British Columbia, an avid gardener and a member of the British Columbia Iris Society was presented with a Pacific Coast Iris (PCN) named after her for her dedication to the iris society, and for being instrumental to helping put together the 2011 AIS Convention. Ms. Campagnolo was named Honorary Patron of the Convention. ‘Banner for Iona,’ is a beautiful PCN that was gorgeously blooming at the guest gardens. While Lieutenant Governor, Ms. Campagnolo greatly enhanced and developed the Government House gardens; a group she established of over four hundred volunteers takes care of the Government House Gardens in Victoria. The house serves as residence to the British Columbia Governor. Registration information: 'BANNER FOR IONA' by Joyce Prothero, (R. 2010). Sdlg. SS-B. 14" (36 cm), EM. S. silver lavender, lighter center veined darker lavender; style arms silver lavender, darker lavender midribs and crests; F. broad silver lavender band, center light lavender veined darker, small yellow flash signal; SPCNI seed exchange. 'Foothill Banner' X unknown. 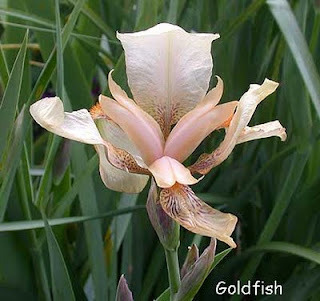 For those missing the iris blooms once the bearded season ends why not try some beardless species to extend the season? Here's a few I really enjoy seeing in summer. Louisiana irises come in an amazing array of colors. 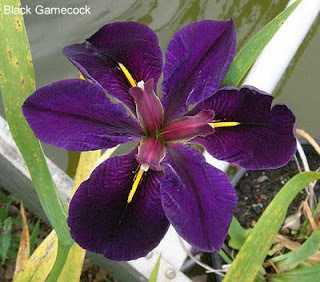 'Black Gamecock' is a beautiful deep purple, nearly black, and is very cold hardy. It is a reliable bloomer here even tho I am sure it would like more water in the dry summer months. Tho they thrive in their native bogs they do just as well in rich garden soil with average watering. 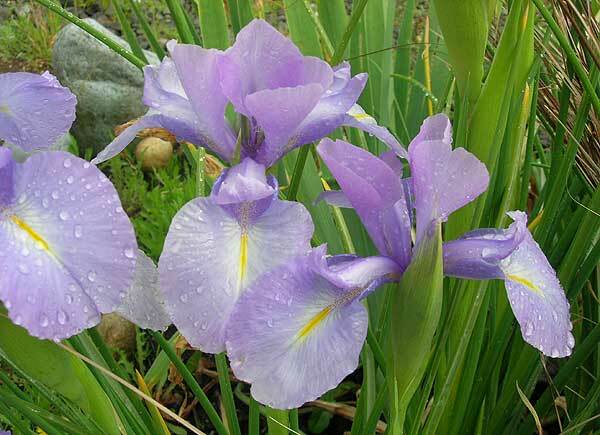 English irises are a bulbous species related to Dutch and Spanish irises. They are not native to England, but they do best in its cool mild climate, as well as here in the Pacific Northwest. Each July brings blooms on the Japanese irises in my garden. I don't have many as our dry, sandy conditions are not to their liking, but a few rugged varieties manage to thrive for me. This is one, a large flowered variety in shades of lavender and blue with bright yellow-green darts at the heart. 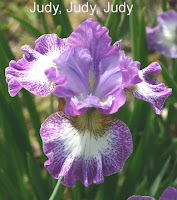 Consider trying a few of these types if you're looking for irises with mid-summer impact. 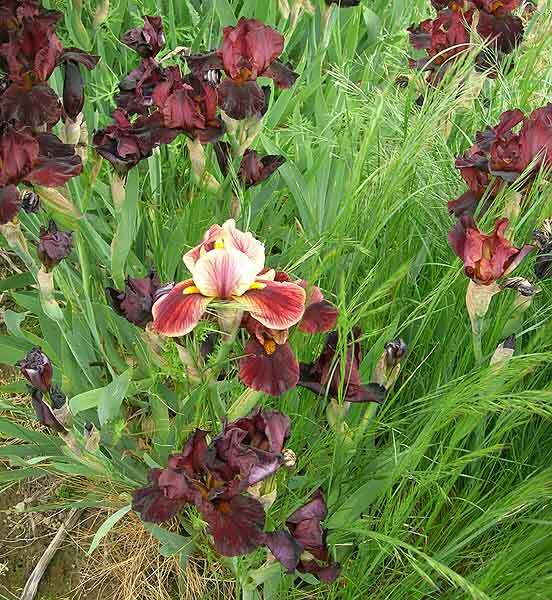 With the right combination of species and varieties you can have irises in bloom almost all year long.